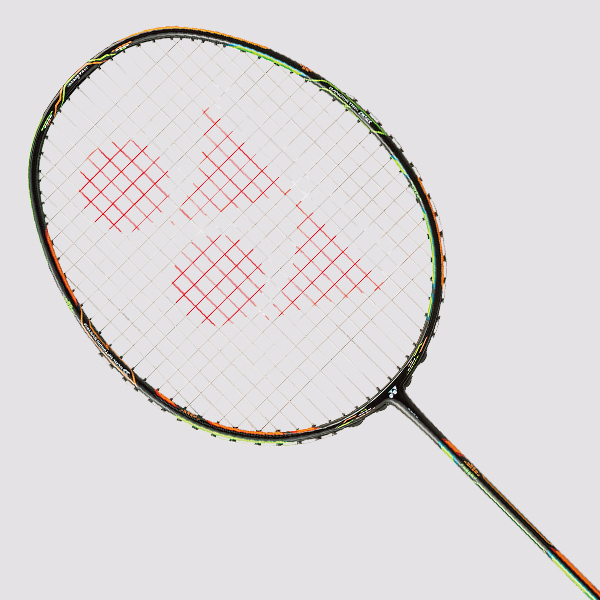 Yonex Duora 10 Badminton Racket is something new and unusual to the badminton market. The Duora uses two frame profiles to achieve the benefits of control and speed depending on which side of the racket is used. The bright colouring acts as a guide in your peripheral vision to which side you are using.Dual Optimum System - Frame profiles are normally designed around stability, aerodynamics or balance of both. The Dual Optimum System is half stability and half aerodynamic. The two sides of the frame use different profiles, rather than one profile trying to do both jobs.Stability - On the orange side the racket uses a box shape frame to resist torsion and twist for more power transfer and precision.Aerodynamic - The green side uses an aerodynamic profile with a Nickel-Titanium Fibre running around the crest for strengthe and durability.Nanometric DR - Nanometric improves the bonding strength between carbon fibres allowing thinner carbon structures to have the same strength as thicker ones that don't use nanometric. Nanometric DR is used the the head of the racket in the box section to provide strength and stability around the head. Free delivery available on Yonex Duora 10! Order now! Do you own the Yonex Duora 10?